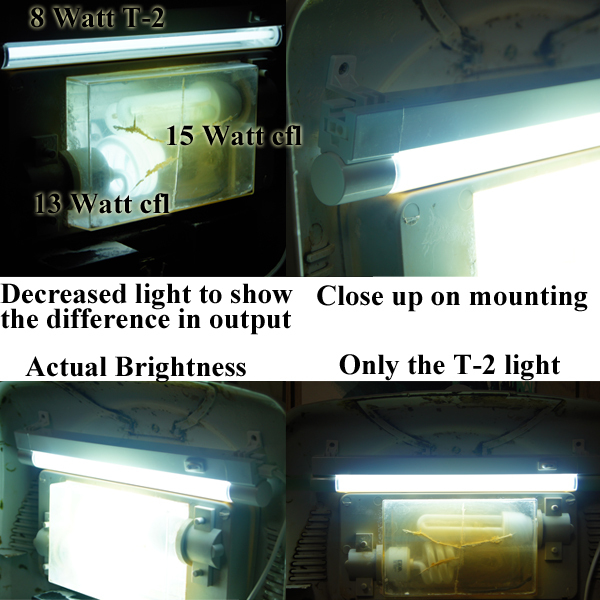 Although not as well known as their larger T5 and T12 cousins, the T2 subminiature aquarium light offers a unique small yet higher output of PUR per watt of electricity used over their larger cousins. Despite what others such as a misinformed member at Aquatic Plant Central said (Niko), these are not just “to mount under kitchen cabinets”. Yes, the original T2 Light fixtures were just that; for high light in a small space, generally storage, cabinets and similar. But the same can be said for almost all other aquarium lighting from T8, T5, to LEDs; these all got their start for other lighting applications and then correct Kelvin, reflectors, etc. were added to make these work for aquatic applications. 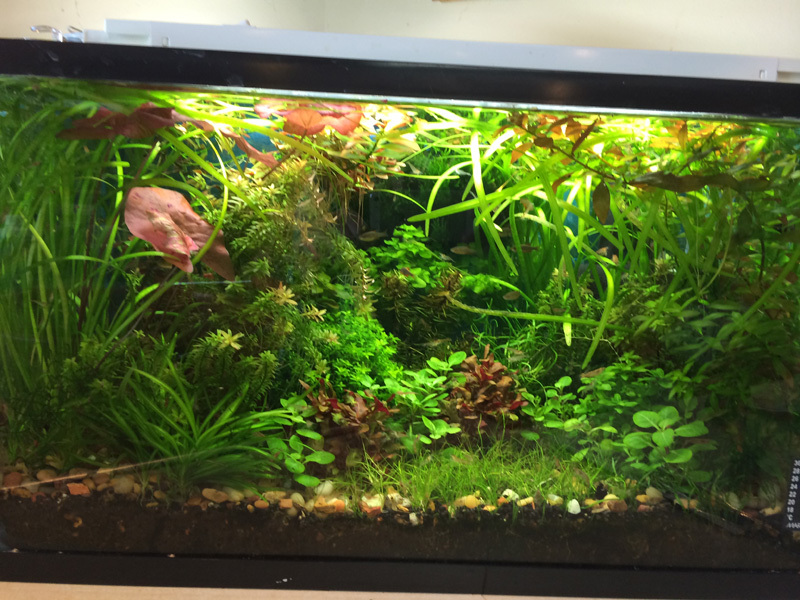 What is unfortunately missed by anecdotal comments such as those made at Aquatic Plant Central (admittedly this post is almost two years old, but others still read this when searching for answers), is that the aquarium industry as a whole is but a needle in a haystack and that much of the equipment, treatments, even quality fish foods have been developed in other industries since there is little development funding in the aquarium industry due to its size. Please see the above/left planted 60 gallon aquarium that is lighted with (6) 13 Watt 6400k T2 Lights. 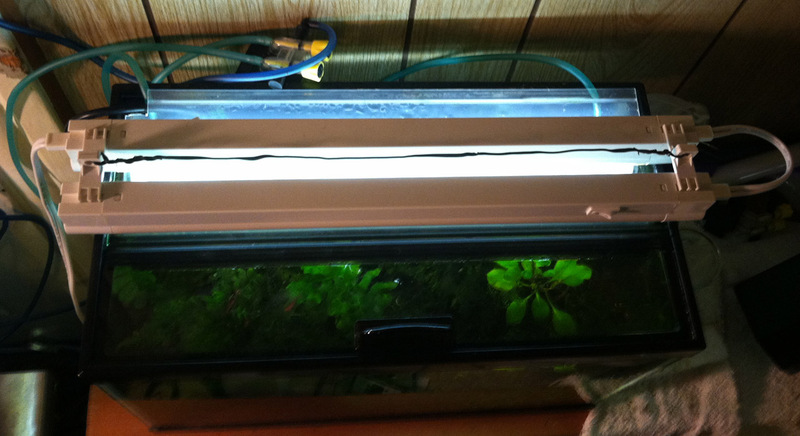 Or see the picture to the left for a 10 gallon planted aquarium with only two 11 Watt T2 Lights. Neither tanks are using supplemental CO2 other than Flourish Excel. Both pictures can be enlarged by clicking on. With the new rotating focusing lens and the Tropical Noon 6400K daylight lamps, the T2 is viable alternative T5s and especially T8s and CFL lights. The lumen output is 73 lumens per watt (better than any CFL), with a slightly higher blue content (with slightly less useless green/yellow light energy) than comparable CFLs. The bottom line is; the best 6400K T2 lights with their high lumen per watt and PUR output require as little as 1 to 1.25 watts per gallon for a planted aquarium! The picture above left shows the underside of an old Bio Cube Aquarium hood with two new CFL 6500K Daylight Bulbs (one 13 watt and one 15 watt) plus the addition of just an 8 Watt 6400K T2 Retrofit! The Picture below is this same 14 gallon Bio Cube showing the light differences in the aquarium. It is noteworthy that the T2 is more forward in the hood, so when only the T2 is on the back of the aquarium is slightly dark. This said, it is still obvious that the One 8 Watt T2 completes quite well with Two CFL lights of approximately 75% higher wattage. The reader should also note that the T2 produces a slightly more crisp light. Below is a top view of just many ways to mount these VERY versatile lights, which can be simply placed on top with spacers, mounted into a hood, mounted into a shelf above, mounted into a wall or board behind the tank, or many other ways anyone with just a small amount of creative skills can think of!! For marine aquariums, the T2 fall short for applications much over 12 inches in part due to the fact they are currently available in 6400K daylight (which is generally the most PAR/PUR optimized kelvin temperature), however higher kelvin temperatures of 9000K to 14000k are necessary for increasingly deeper aquariums. This said, the T2 can still be used in a marine/reef aquarium lighting mix with T5, LED, etc of higher Daylight Kelvin as well as blue/actinic. Also the T2 6400K daylight is excellent for many Reef Aquarium Refugium and/or sump applications. Back to Planted Freshwater or Fish only freshwater, these T2 lights are unbeatable for the light output in a small space, with exceptional plant growth to prove it. This is based personal use as well as a many friends in the aquarium industry now using these lights. In fact one friend told me that he knows of a client from NASA who has purchased several on many occasions (what he used the lights for, I do not know). Probably the biggest draw back as I see it for the T2 Light is the fragile size of the lamp, but even here I have seen few difficulties other than the very small contact area between the lamp and the fixture which is easy to move the lamp “out of place”, resulting in the lamp not functioning. This is one reason the T2 Aquarium Light is not available in sizes over 21 inches; however this too is overcome with the nice linkable feature that each fixture comes standard with which basically makes each light fixture into a larger one. It is noteworthy that as of 2018, T2 aquarium lights have been discontinued due to the economy of the professional aquarium industry. 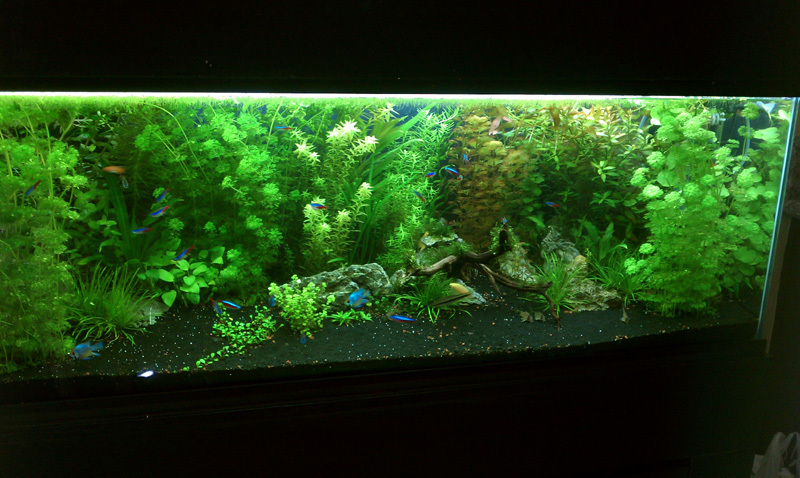 This said, if one is looking for a lower cost light, that still is of modern technology, consider the AAP Clip On LED light for standard or planted aquariums.